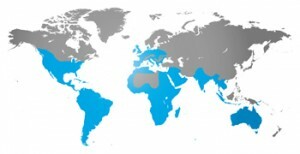 Where can you find European Rabbits? Oryctolagus cuniculus, also called a European, an Old World, or a domestic rabbit, is the only species in its genus. The last Ice Age confined the species to the Iberian peninsula and small areas of France and northwest Africa, but due to human action and adaptability of this species, European rabbits today exist in the wild on every continent except Asia and Antarctica. Domesticated O. cuniculus may be found worldwide. How many babies can a rabbit have? Rabbits are well-known for their reproductive capacity. Oryctolagus cuniculus is capable of reproducing year-round, but most breeding activity takes place in the first half of the year. Gestation is about 30 days, and the average litter contains 5 to 6 young. Females experience postpartum estrus and thus may have several litters per year. Neonates, called kittens, are naked, blind and helpless. The mother visits the nest for only a few minutes each day to nurse them, but the milk is extremely rich. Young are weaned at four weeks of age, attain sexual maturity at about eight months, and can live up to nine years old. However, mortality rates in the first year of life frequently exceed 90%. If soil conditions and forage supply permit, they prefer to live in groups in large, complex burrow systems (warrens). A typical colony consists of six to ten adults of both sexes. Colonies have distinct dominance hierarchies, which are particularly important for males, as dominance position determines which male will have preferential access to mates. A male’s position in the social hierarchy means that potentially costly conflicts between males over females are rare. Territoriality is also most evident among dominant males during the breeding season. generally nocturnal, spending its days underground and foraging from evening until morning. Though generally silent, rabbits are capable of making loud screams when frightened or injured. They communicate with each other through scent cues and touch, and thump their hindlimbs on the ground to warn of danger. The European rabbit or common rabbit (Oryctolagus cuniculus) is a species of rabbit native to southwestern Europe (Spain and Portugal) and northwest Africa (Morocco and Algeria). It is also known as an invasive species because it has been widely introduced to countries on all continents with the exception of Antarctica and sub-Saharan Africa, often with devastating effects on local biodiversity, environments and ecosystems. Australia has the most problems with European rabbits, due to the lack of natural predators there. The European rabbit is well known for digging networks of burrows, called warrens, where it spends most of its time when not feeding. Unlike the related hares (Lepus spp. ), rabbits are altricial, the young being born blind and furless, in a fur-lined nest in the warren, and they are totally dependent upon their mother. European rabbits are domesticated and common throughout the world. However, wild rabbits are near threatened.